In the spirit of “crisis” brand management, let me admit that my Delicious bookmarking fell off in March and April. Maybe that’s a good thing as the articles that did get my attention had to be serious intellectual or hot news contenders. And, it seems, they were. Early Spring ’11 speaks to empowerment and engagement. Privacy, browsing, and tracking continue to heat up. Peer-to-peer wisdom suggests average consumers applaud anti-tracking legislation without fully understanding. They assume tracking behavior compromises individual privacy that includes e-mails and personal identity. All the hacking and security breaches don’t help the matter. Congress is heating up the battle with legislation proposals. Industry organizations are hustling to complete opt-in privacy and do-not-track options. You’ve got an online reputation – period. Article reviews the challenges of managing the good, bad, and scary with content, apps, and action. The more-not-less solution proves intriguing. Do Not Track packs a punch with new Apple Safari browser. What will this mean for marketers? Smart startup aims to keep 60 million global consumers feeling the love by focusing on service with a smile, phone calls and manpower. When Eric Neuner, then a 23-year-old newly-minted MBA, bought a chain of cobbler shops in the mid-1990s, it seemed as if the shoe repair industry was going the way of land line phones, paper mail, etc. He saw an opportunity. Thank you to MediaPost, the New York Times, American Express OPEN Forum, Digital – Advertising Age. This month’s wordpring created with WordItOut. © 2011.Wordprint content © 2011 eamcc.wordpress.com. All rights reserved. Will business enterprises move fast enough to get in line with Web 2.1 enterprise structure and vision? Groupon, Zappos, and this cobbler by mail seem to have a leg up on the Sign on to wordpress.com (even subscribe to this blog) and share your comments. You can also bookmark or share with a colleague. What’s your opinion on Delicious wordprints? This month’s wordprints were created with worditout.com. 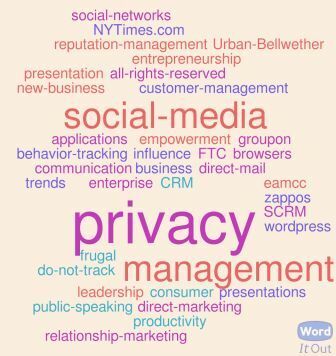 This newly discovered tag cloud creator provides great efficiency in preparing these tag clouds for posting. Resolution isn’t quite as sharp as desired. What’s your take. Is the “cloudiness” a distraction? Your feedback is certainly welcome.